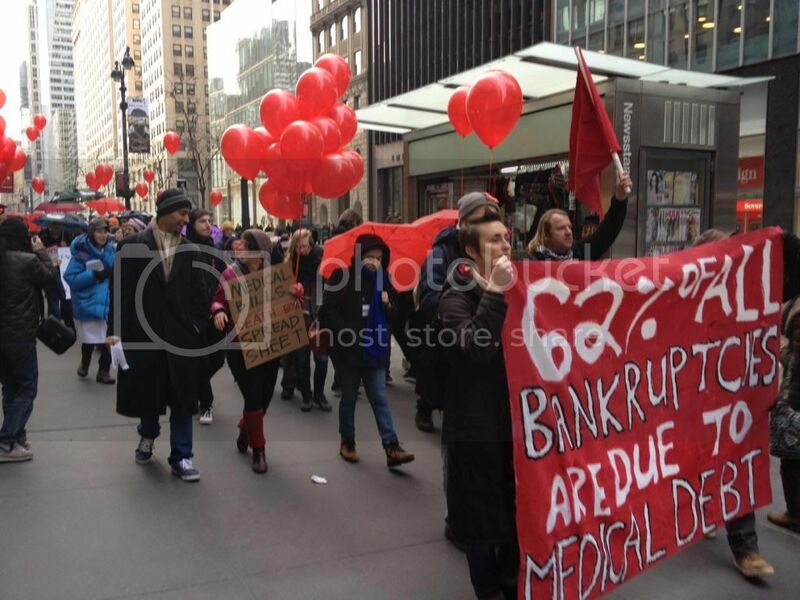 Sixty-two percent of all bankruptcies are due to medical debt—and Occupy activists aren’t letting the medical-industrial complex get away with it. 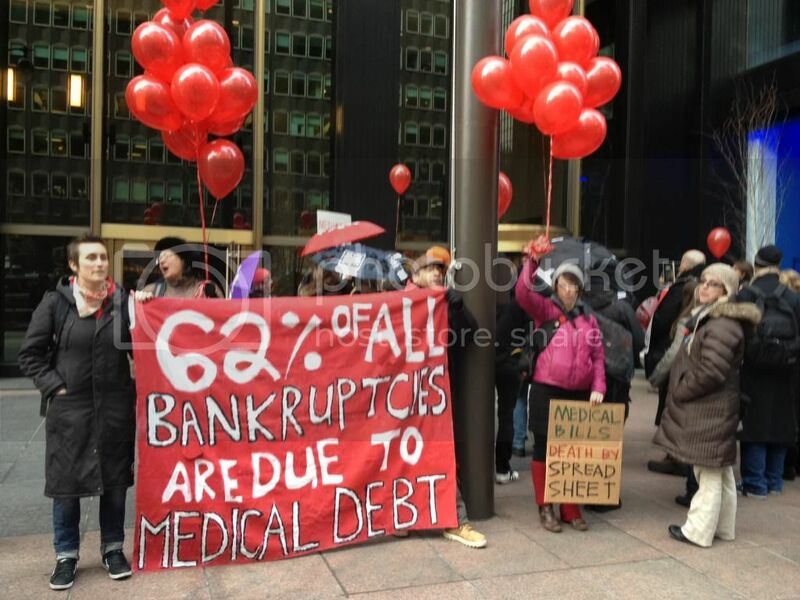 Strike Debt, a group that emerged from the Occupy Wall Street movement, has planned a week of actions in multiple cities across the country to mark the abolition of $1.1 million in medical debt belonging to 1,064 people as part of the “Rolling Jubilee” project. While that may already seem like a huge number, Strike Debt claims it’s only getting started and ultimately hopes to abolish around twenty times what they raised, which would be nearly $12 million. In order to kick off the “Life or Debt” week of action, protesters planned a medical bankruptcy tour to the various health insurance companies who Strike Debt sees as being exploitive of the sick and vulnerable by using insurance payments to fatten the wallets of the companies’ CEOs instead of using that money for actual healthcare. Paused before Aetna’s offices on Park Avenue, an activist announced to the group that Aetna’s CEO Mark Bertolini received over $10 million in total compensation last year, which is around 300 times the average worker’s pay. A woman named Jamie spoke in front of Aetna’s office about how she wrote a letter to Bertolini after being denied coverage by the company due to a chronic work industry. Jamie’s letter was returned, unopened. In front of the insurance giant CIGNA, a protester recounted the death of 17-year-old Natalie Sarkisyan, who died after having her liver transplant surgery first denied and then later delayed by the company. In 2007, Natalie’s mother addressed a crowd of supporters in front of CIGNA’s Philadelphia headquarters. “CIGNA killed my daughter,” Nataline’s mother Hilda told security. “I want an apology.” Sarkisyan was not able to speak to [CIGNA CEO] Hanway; a communications specialist talked to her instead. After their conversation, employees heckled the group from a balcony; one man gave them the finger. CIGNA called the police and had the family and their friends escorted from the building. A CIGNA executive later apologized for the incident in a letter about a month later. Over the weekend, Strike Debt activists have planned a free health fair and march to highlight hospital closings. The march will feature sites like the closed St. Vincent’s community hospital, which will enjoy a “second life” as the site of luxury condos priced between $1.4 and $8.2 million. The tour will be followed by free legal advice and health care at Judson Church. 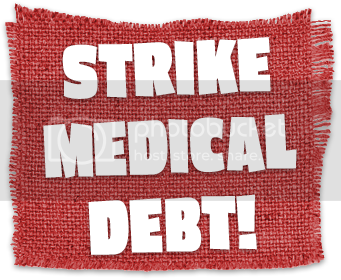 On Saturday, practitioners will also be on call to answer medical questions at Strike Debt’s website. In Los Angeles, homeless vets are fighting for a place to sleep. Read Jon Wiener’s take in the April 8 issue of The Nation.